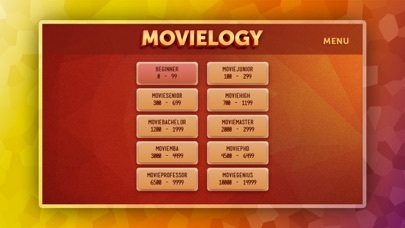 Movielogy is an academy, where you start as a Beginner and graduate as a Movielogoholic. What you need to do is guessing the corresponding act for the given movie and vice versa. You also need to know co-starring acts for same movies. It looks simple, yes? Try it! 10 LEVELS Apply to our academy by downloading the app. Pass the proficiency test as a Beginner and become Moviejunior. Then you will have to proceed through Moviesenior, High, Bachelor and etc. levels till you become Movielogoholic. It is hard way to go, but you will like it. No pain – no gain. 400 ACTS Each level will unlock 40 new acts. With new acts you will get access to new movies. 3584 MOVIES This is a lot, yes? 400 acts have 3584 movies in common. You should know who acted with whom. REGULAR UPDATES Did you become Moviemaster? Do you want to compete with your friend? Enter into the “Ranks” and see where you and your friend stand. 3584 movies? It is only up to now. The industry does not stop. New movies are regularly made. You will see them in our database as soon as they are released.